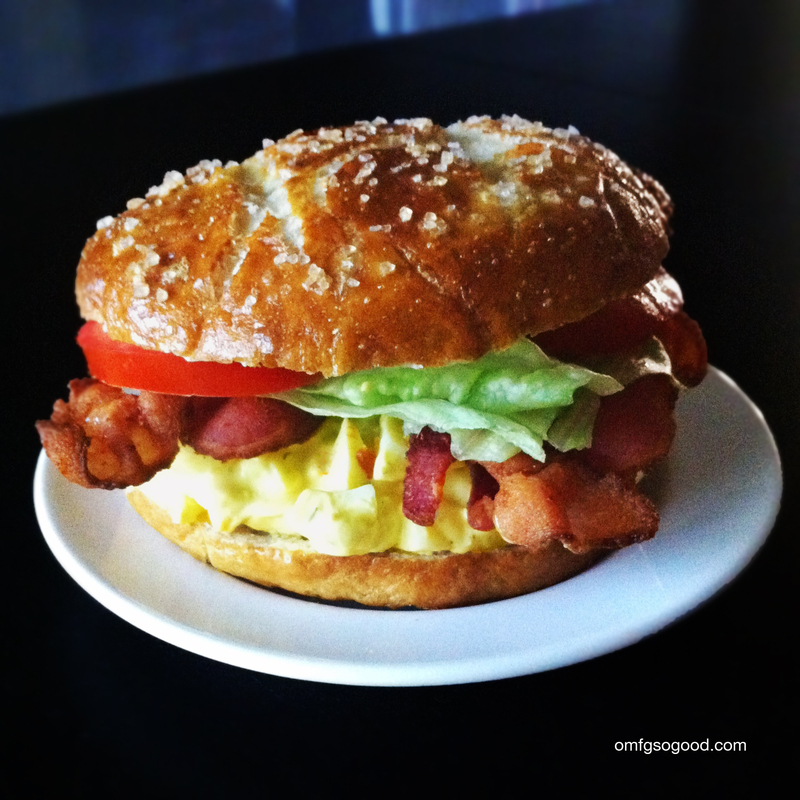 egg salad BLTs on pretzel buns | omfg. so good. When I was pregnant with Picky Eater I craved lunch meat. I mean I really, really wanted to eat it every day. Unfortunately it’s on the list of top things NOT to eat when you’re pregnant, which is probably why I really, really wanted to eat it every day. Fortunately I have awesome friends who know how important good food is to me. One of which turned me on to a local sandwich place that practices ‘the art of sandwichery.’ So much so, that they’ve named all of their menu offerings after famous artists. The Dali (egg salad with lettuce, tomato, cream cheese and bacon) quickly became my new pregnancy bestie. For some reason, last week I couldn’t get that damn sandwich off my mind. No, I’m not pregnant. 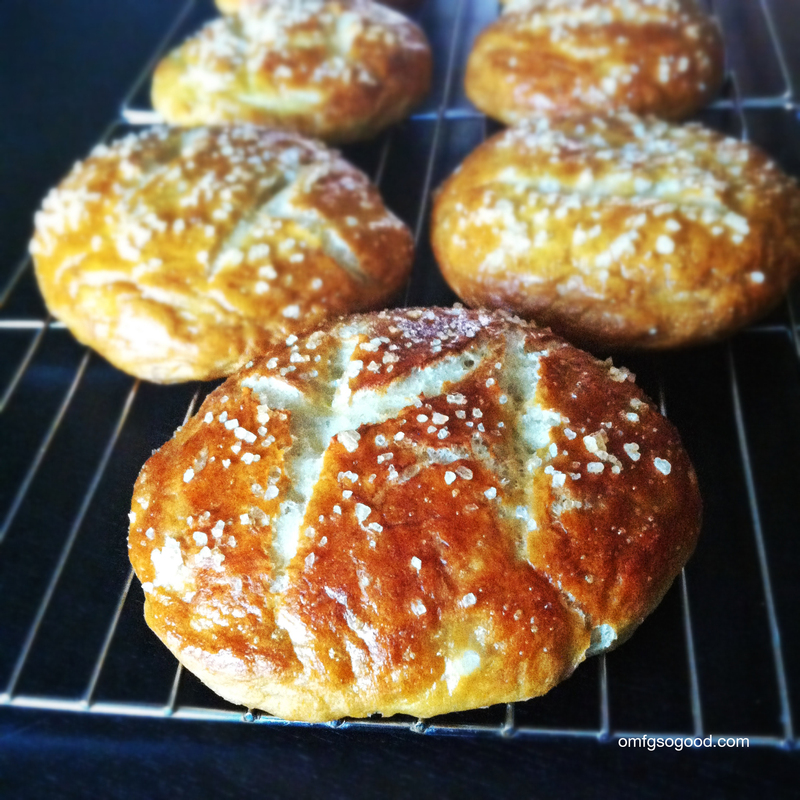 I also couldn’t kick the idea of a good Philly style soft pretzel. The two cravings collided and fine sandwich art was officially achieved. Believe it or not, these were really easy to make and definitely worth the extra time. The texture is pretty spot on to a chewy, soft ballpark pretzel and the coarse salt topping made for the perfect companion to the egg salad. 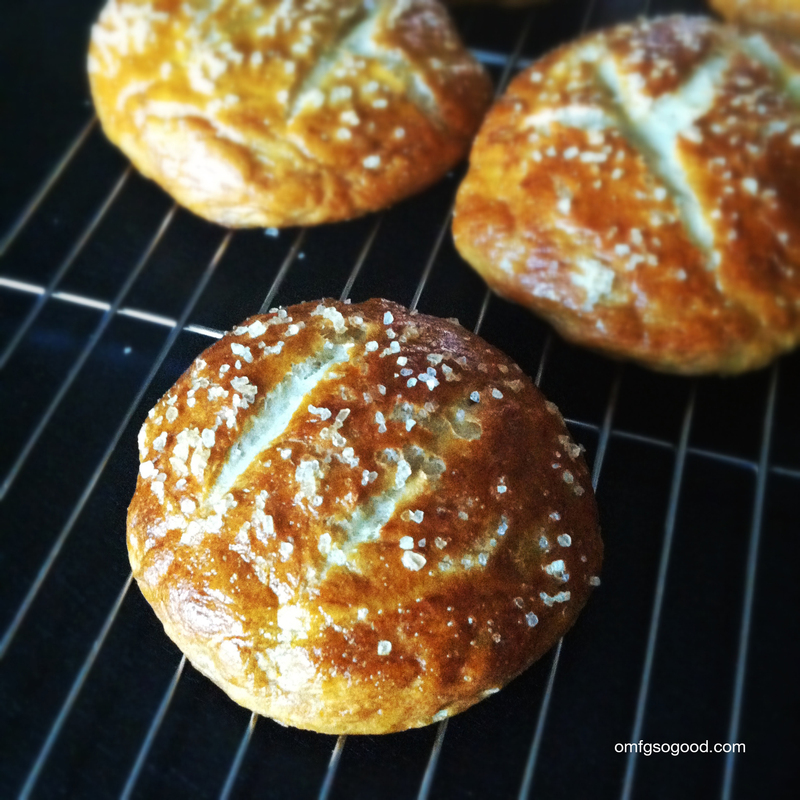 Warning: if you make these you may never again be satisfied with a store bought burger bun. Never again. In the bowl of a stand mixer fitted with the dough hook, combine the water and yeast and let rest until foamy (around 10 minutes.) Add the sugar, butter, salt and flour and mix with the dough hook until thoroughly combined. (You can also do this with a large wooden spoon if you don’t have a stand mixer with a dough hook. Work those arm muscles and earn your buns.) Cover the dough with a towel and let rise in a warm place for around one hour, until it’s doubled in size. Punch down and turn out on to a lightly floured surface. Line two sheet pans with parchment paper and set aside. Cut the dough into 8 – 10 equal sized pieces. To shape the dough balls, start by pulling the sides into the center and pinching to seal. Place the pinched side down on the counter, cup your hands around the dough and roll it lightly to form a smooth bun shaped ball. Place them on the prepared sheet pan, pinched side down, at least 1″ apart. Cover with a towel and let rise for another :30 or until doubled in size. Preheat the oven to 425 degrees and place the racks on the middle and lowest positions. In a large saucepan, bring 2 quarts of water to a low boil, remove from heat and SLOWLY add in the baking soda. Return to heat and reduce to a low simmer. Put the dough balls into the poaching liquid, pinched side down, and cook for 30 seconds then flip and cook for an additional 30 seconds. Remove with a slotted spoon and return to the prepared sheet pans, pinched side down. Brush each roll with beaten egg and sprinkle with coarse salt. Using a sharp, straight edged knife, cut two slashes or an “X” in the top of each roll. Bake in preheated oven for 20 – 25 minutes. Remove from oven and transfer to wire racks to cool. Chop the eggs then toss in a bowl with mayonnaise, mustard, dill, garlic powder, salt & pepper. Mix to combine then refrigerate until ready to use. To assemble, spread a small amount (1 tbsp or so) of cream cheese on the top half of each bun, scoop egg salad on to bottom half of the bun, top with bacon, lettuce and tomato. We’re vegetarian, so the lunch meat will always be out. But on the other hand, the bread looks a.maze.ing. So, we’ll totally be trying this one out.